I saw this on Michael Ruhlman’s blog on St. Patrick’s Day, and it made me wish I had time to make it that same day. Instead, I decided to wait until my (Irish) in-laws came to town for a visit. I actually made two briskets – wrapped separately – and left the second one in about an hour longer than the first. It was much more tender, so I’ve updated the attached recipe to reflect the extra hour of cooking time. 5:45 before mealtime – Preheat oven to 250 degrees. Slice onions. 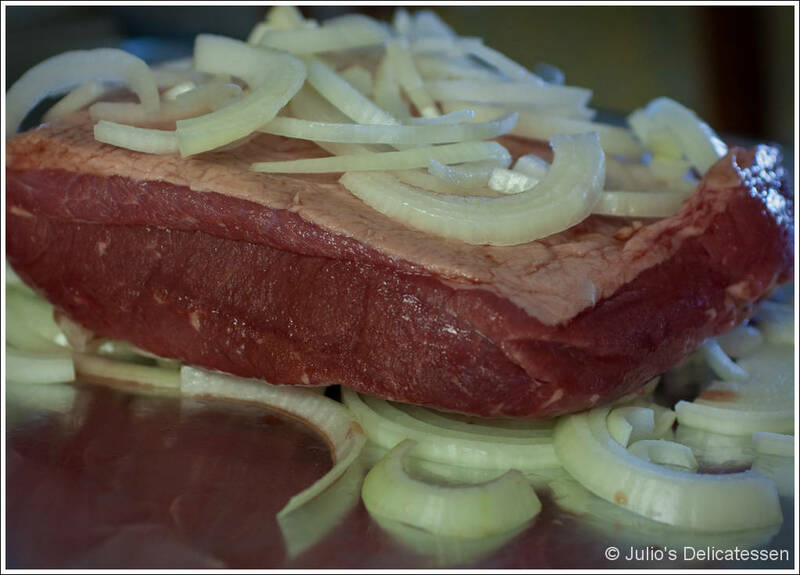 Tightly wrap brisket and onions in foil (ideally in such a way that liquid will pool in the bottom of the foil and not spill out of the pouch). Place inside roasting pan and place in the oven. 45 minutes before mealtime – place redskins in well salted water. Heat to just less than boiling. 35 minutes Cook bacon in a large sautee pan (for which you have a lid that will be used in a few minutes). Cut cabbage into segments (through the root end so it stays together). Remove bacon and discard. 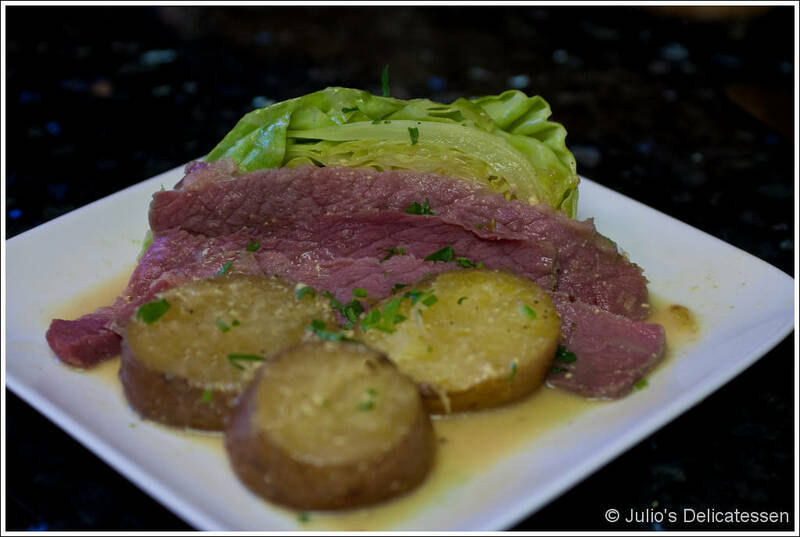 15 minutes before mealtime – working quickly, unwrap meat, slice, then add to the cabbage. 10 minutes before mealtime – when cabbage is tender, remove meat and cabbage to plates. Add some Dijon mustard to the liquid. Swirl to mix, then spoon over cabbage. 5 minutes before mealtime – Drain the potatoes, slice into ½ inch rounds, toss with butter, parsley, and salt. Add to plates and serve.